In March I had the good fortune to join the seventh annual Green Schools National Conference in Atlanta, the leading gathering of environmental educators focused on school sustainability. 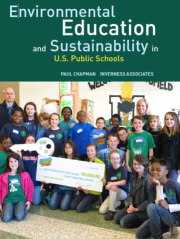 Having attended every one of the Green School conferences since the movement was launched in Minneapolis in October 2010, at the beginning of my new career developing sustainable schools, I was pleased and proud that the conference itself was one of our best. We were challenged in the early years to run big conferences in cities across the country, from Boulder to Sacramento, from West Palm Beach to Virginia Beach, but this conference was directed by the U.S. Green Building Council and its new, young leader of the Center for Green Schools Anisa Heming. There were a number of excellent speakers, from San Francisco State professor Antwi Akom on “Race, Power and the Environment” to Mayor Kasim Reed on the city’s role as a green leader, from California educator Jose Flores on how to green a school in the classroom, to Agnes Scott president Elizabeth Kiss on “Why Green Schools Matter: Living, Learning and Leading in an Era of Climate Change.” Our outstanding executive director Jenny Seydel reported on our progress in building the movement, and proudly launched the impressive environmental journal Catalyst as a companion to the timely and topical monthly newsletter of best green school practices. I was impressed with several high-quality workshops. Boulder Valley Schools Sustainability Coordinator Ghita Carroll, whose leadership I profiled four years ago in Greening America’s Schools, told of continued progress in “The Power of Energy Planning and Student Energy Audits” by developing system-wide goals and measuring progress. Similarly, San Francisco Unified Schools Sustainability Director Nik Kaestner described the district’s progress toward a goal of zero-net energy in 2045, a step-by-step, organic process that demonstrated the progress made since my profile in 2012. Jamie Cloud and a team Lovett, a K-12 independent school in Atlanta, described their approach to “sustainabilizing” the curriculum. Anissa Heming’s panel sought to “prove it” by showing how student involvement can help demonstrate environmental performance. And California’s Green Ribbon Schools coordinator Lesley Taylor, along with several educators, told how the state is using its new environmental literacy plan to “teach with standards, rooted in sustainability.” I was proud to have nominated the California Environmental Literacy Steering Committee for a special award to recognize the state’s bold leadership in using its new environmental literacy blueprint, which I helped to author, to stimulate significant change in the K-12 curriculum. We are already making plans for our next conference, to be held in spring 2018, in Boulder, Colorado. 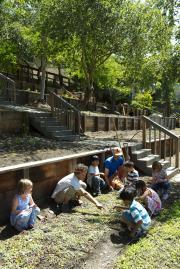 It is good to see the green schools movement gathering momentum!